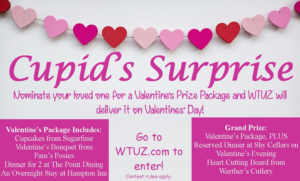 Surprise your Valentine this year with a Prize Package from WTUZ! It’s our Cupid’s Surprise, presented by Warther Cutlery! Nominate your loved one to receive a special visit from WTUZ, along with all the prizes! WTUZ will choose 5 winners, and on Valentine’s Day, will surprise them at home or work to deliver the goodies! The Prize Package includes Cupcakes from Sugarfuse, a Valentine’s Bouquet from Pam’s Posies, Dinner for 2 at The Point Dining, and an Overnight Stay at Hampton Inn! The Grand Prize Winner will receive the Valentine’s Package, PLUS, a reserved Dinner for 2 on February 14 at Shy Cellars and a Cutting Board from Warther Cutlery. Entries must be submitted by noon on Tuesday, February 12th, and will only be accepted through the entry form at WTUZ.COM. Hampton Inn stays and Dinners at The Point Dining will be given in the form of a gift certificate to be used within 1 year of receipt. Grand Prize winner must redeem the Dinner for 2 at Shy Cellars on February 14 at 6:30pm. Prizes will be delivered on February 14, between the hours of 11am to 1pm. Regular WTUZ Contest Rules also apply.